EEVBlog #221: Lab Power Supply Design Part 1. Dave goes through all of the design considerations and calculations for a micro-controlled power supply. He starts with the basic LM317 regulator for constant current and constant voltage and goes over the limitations. Dave provides a great look at the design process and calculations involved. Note the link to the schematic on the above page. I'm always on the lookout for low cost, nice looking enclosures. I'll present a method of easily making a custom enclosure that looks great on the bench or anyplace else in the house. I touched on this technique in my various comments on the TAP-20 Power Monitor - here I'll spell out the details. Enclosures of this type are perfect for projects using an LCD or LED display, and minimize the machining a panel requires. A small wood box or frame and a plastic panel make a great enclosure. Clear or colored transparent plastic can be used so that an LCD or LED display or LED indicators can show through the panel with no cutouts required. Cutting nice openings can be a downfall, so this works well. The first step is to find a box or frame of suitable dimensions for your planned application. A box with a back is great for "finished" projects where you don't need access to the internal circuit boards. For a dev system or projects under development, a frame with an open back allows access for cables, programming and changing things around. The kit allows engineers to work with the small IC on a USB stick controlled by Vishay's measurement-and-control graphical user interface (GUI). I recommend the kit but with a few reservations about the quality of the accompanying manual. You must decipher many sentences and try to determine what the authors mean. I had hoped for real-world examples, which the otherwise good application information lacks. Dave has posted EEV Blog #186, covering surface mount soldering techniques. "Now the 1206 is an absolute monster. Steveie Wonder could solder this thing! It is so damned easy." Here's another great article from Embedded Lab. The FVR (fixed voltage reference) is included in the 18Fk-series parts with various capabilities. The reference voltage plays a very important role in any A/D conversion. It determines both the range and the resolution (Volt/Count) of the A/D conversion. Besides, the accuracy of the conversion also depends upon how stable the reference voltage is. Usually in PIC microcontrollers, the reference voltage for A/D conversion can be selected as the supply voltage itself or provided externally through one or more I/O pins. But the new enhanced mid-range family of 8-bit PIC microcontrollers have a built-in module that generates a stable reference voltage internally. It is called Fixed Voltage Reference (FVR) where the output is very stable and independent of the supply voltage (VDD). The output of the FVR can be configured to supply a reference voltage for A/D conversion internally. 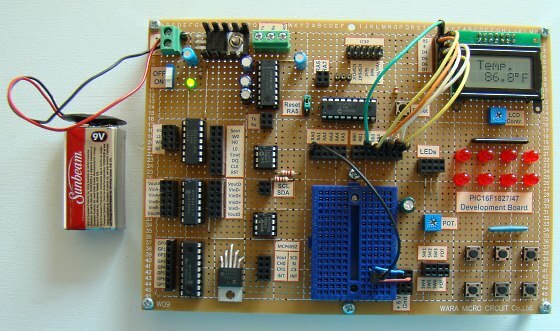 This article describes how to configure the FVR module to derive the reference voltage of 2.048 V for A/D conversion in PIC16F1827 microcontroller. 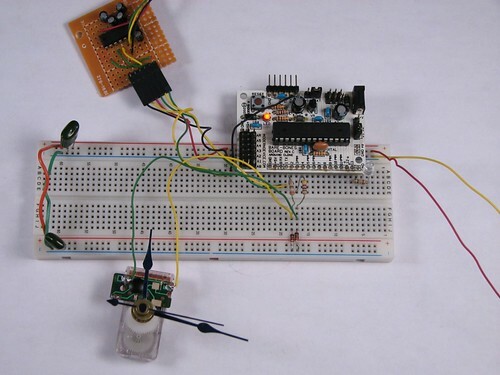 The analog signal for this experiment is taken from the output of a LM34DZ temperature sensor. After the A/D conversion, the PIC16F1827 displays the temperature on a 2×8 character LCD. Isn't this an awesome board layout on perfboard? The following is from Gary's Blog on EEWeb. Think you know what happened? Click the link at the end to read the read of the blog and learn an important lesson. How to Destroy Data and Hardware, Wholesale. So a nice holiday weekend, I decide to reorganize my home office and set up some extra equipment I had sitting around. I pull everything out, unplug all the cables, and dress everything up nicely. I add a network hub, and set up an old PC that I use occasionally, and added the power wall wart to the USB hub I’d been using. Also fixed and set up a scanner. It all looked great and I had more workspace as well. After that, I did have a few hours of work to do for a client, and the latest files were on a thumb drive so I plugged that in and sat down to work. Odd, it doesn’t recognize the thumb drive. I try another one, and it doesn’t see that one either. Hmmm, no external USB HD as well. Plugging directly into the PC USB ports doesn’t work either, but my keyboard and mouse are working OK. Ah, I think I’ve heard of this – Win 7 not recognizing USB mass storage devices. A quick check of the Googlenet, confirms that this is probably the problem. Unplug everything, reboot, uninstall/reinstall drivers. Nope. Roll back the last Windows update. Nope. Stumped. Well, it’s getting late, and I have work to do, I can get the files off the thumb drive on another PC. Plug it in, and* that *PC doesn’t recognize it either. Same for the other thumb drive. What the flock is going on! Think you have the answer? Read the rest of the story.